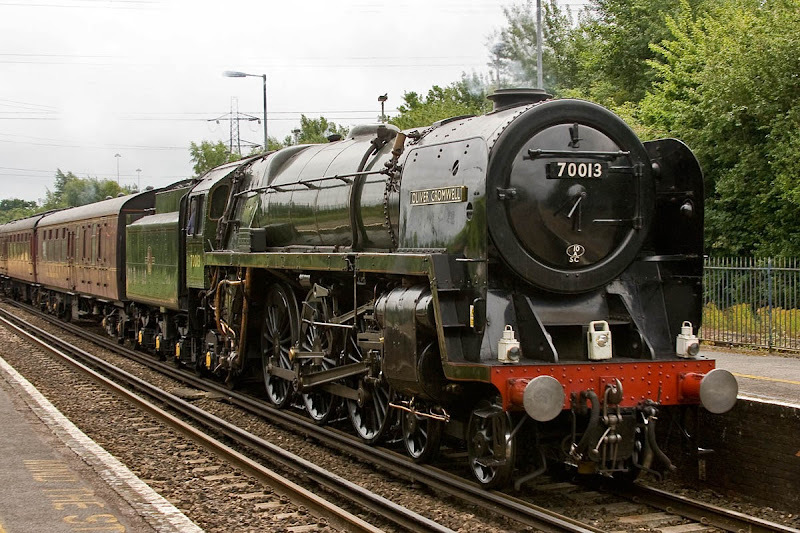 70013 Oliver Cromwell approaches Redbridge. 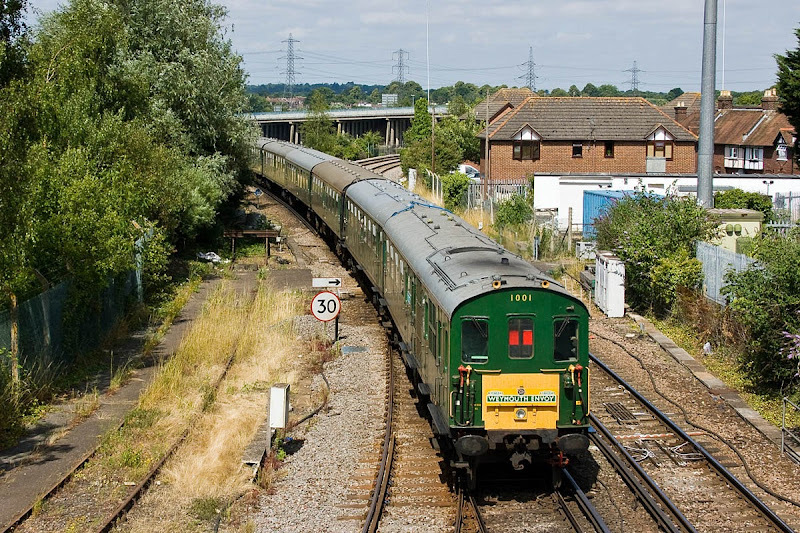 The former Pullman is 99350. 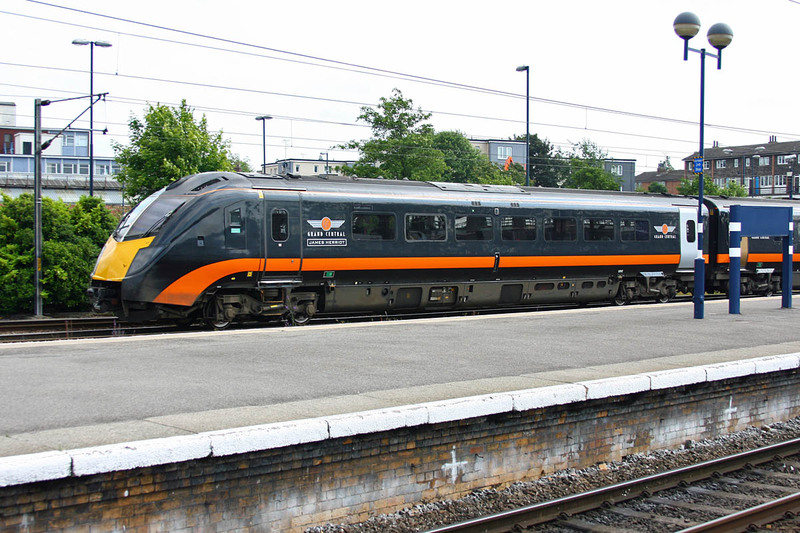 The train operated as 1Z67 08:44 Victoria - Weymouth. Notice the mirror like effect on the smoke box. The support coach is 99953, of the NRM. 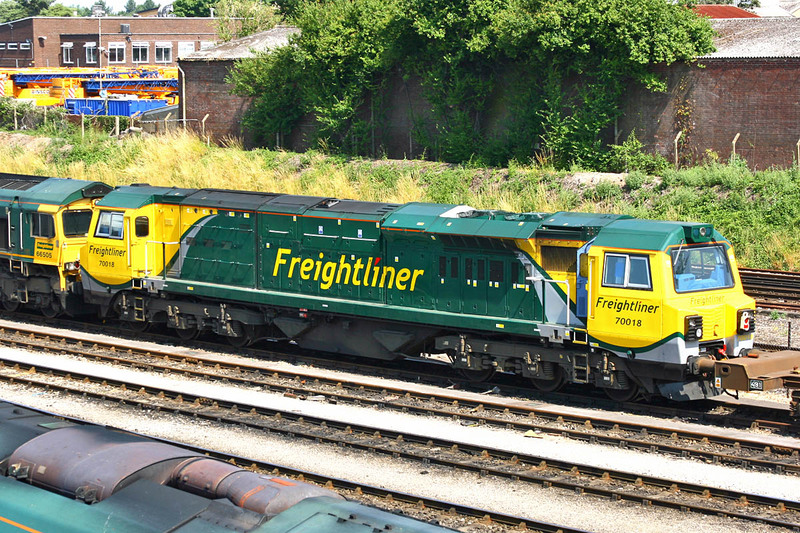 47376 Freightliner 1995 was stored at Southampton Maritime in 2001-02 following an engine failure. 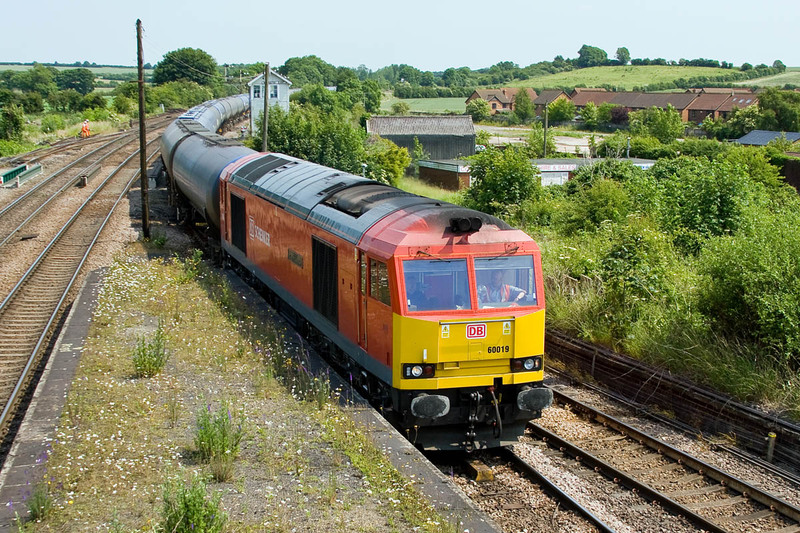 Following acquisition by the Brush Type 4 Fund at the end of 2002, the locomotive had its engine swapped with 47295 in June 2003 at MOD Ashchurch, after which it was delivered to the GWR. 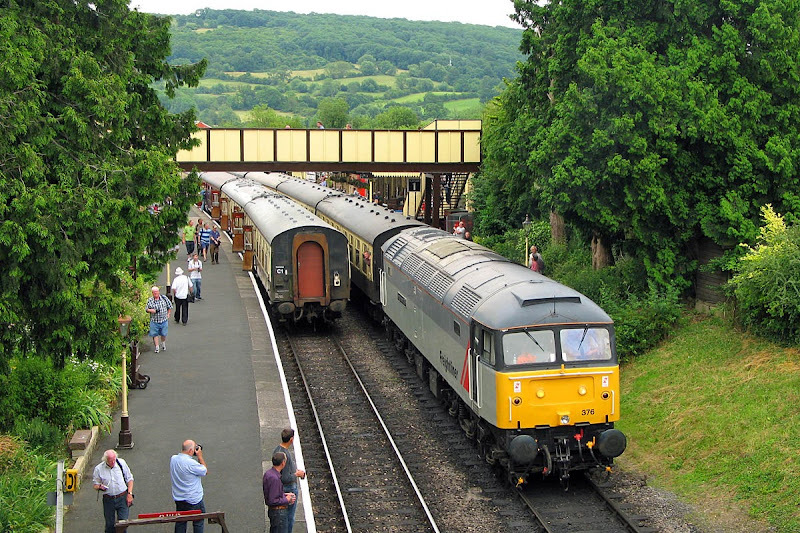 Here the locomotive is seen at Winchcombe, working to Cheltenham, in a rather "inter-regional" scene. 47376 clags away 47 style, running towards the tunnel. At Cheltenham Racecourse, again caught clagging, 47376 starts on its return working, 2L72 16:10 to Laverton. 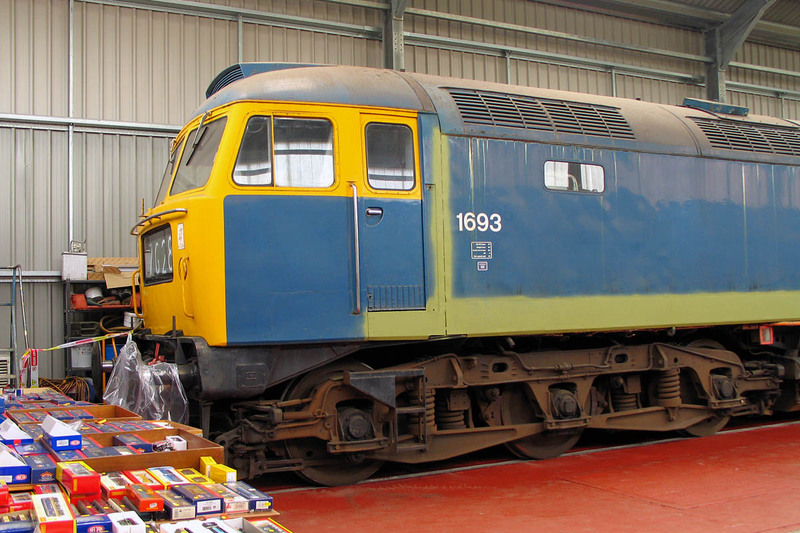 1693 (47105) is under an extended overhaul at Toddington, resident in the new shed there. 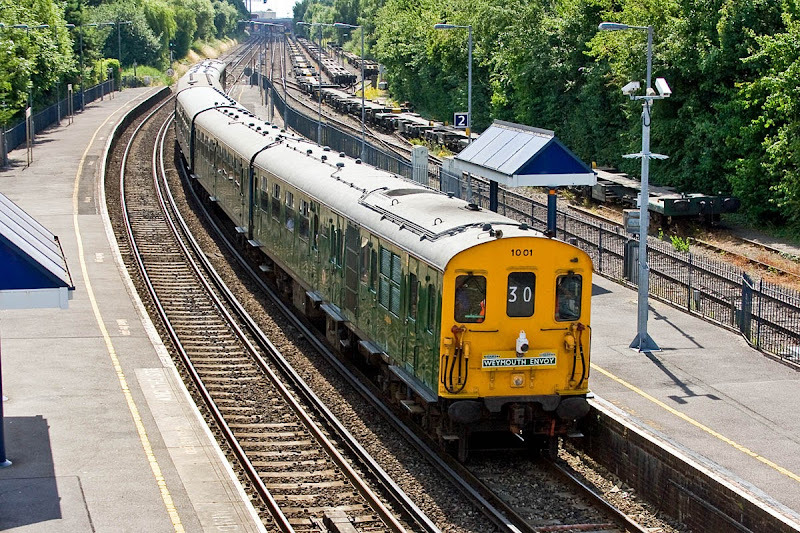 Withdrawn almost 20 years ago in November 1993, and preserved and operational since 1994. Further coverage of the event on SkyDrive. 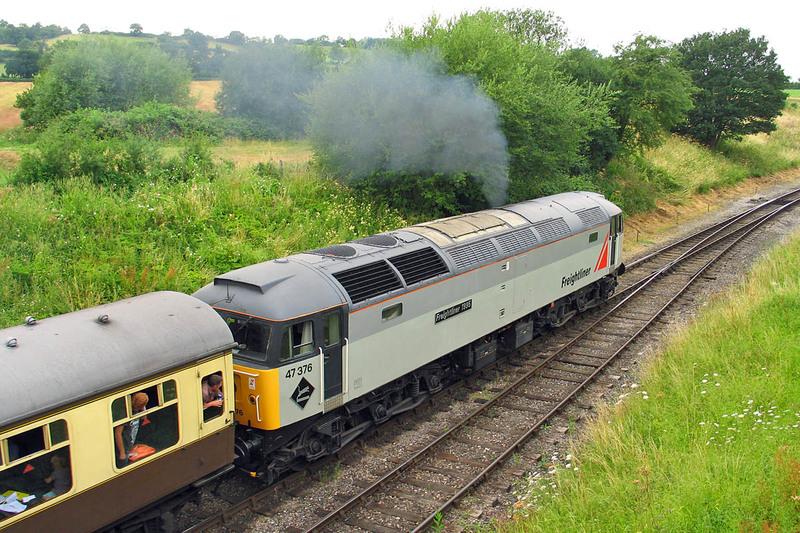 5081 (24081) departs Toddington, on Saturday 27th, at the Gloucestershire Warwickshire Railway Heritage Diesel Weeekend. 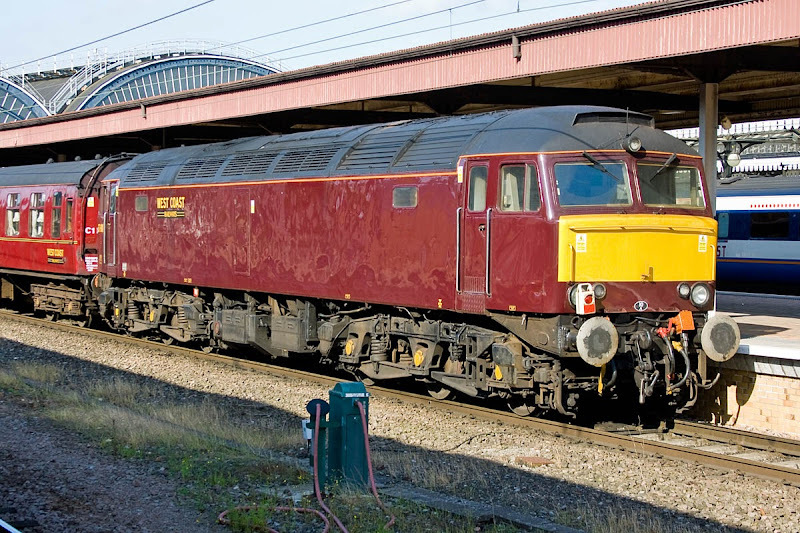 24081 was built at Crewe, entering traffic in March 1960, later classified Class 24/1, and eventually the last in service of the class, withdrawn soon after display at the Liverpool & Manchester 150 event in 1980. 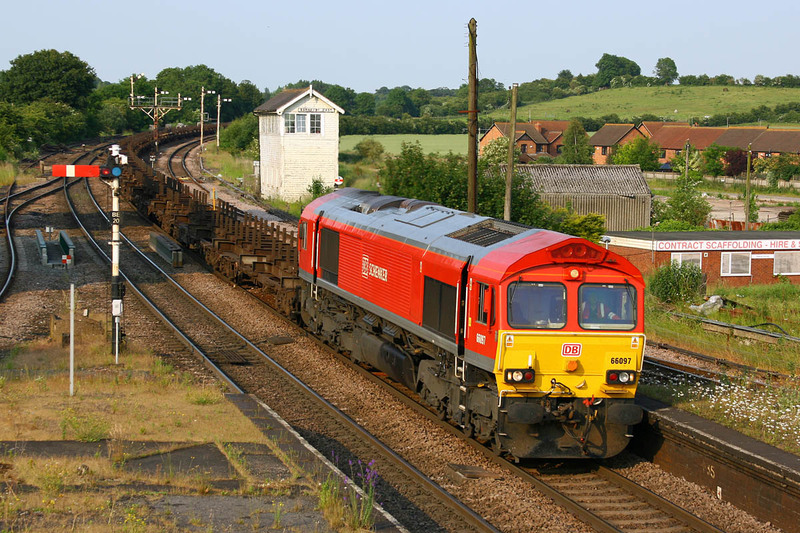 Now supported by the 24081 Locomotive Group. 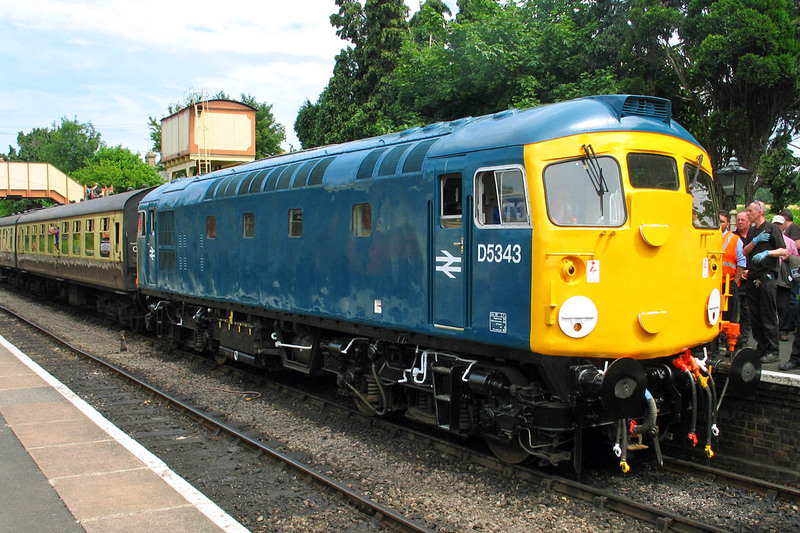 While generally the BRCW Class 26 was a better design than Class 24 to meet the same requirement, newly restored D5343 (26043, new in October 1959) suffered a second traction motor related failure (understood to be a flashover), and could not continue in the event. 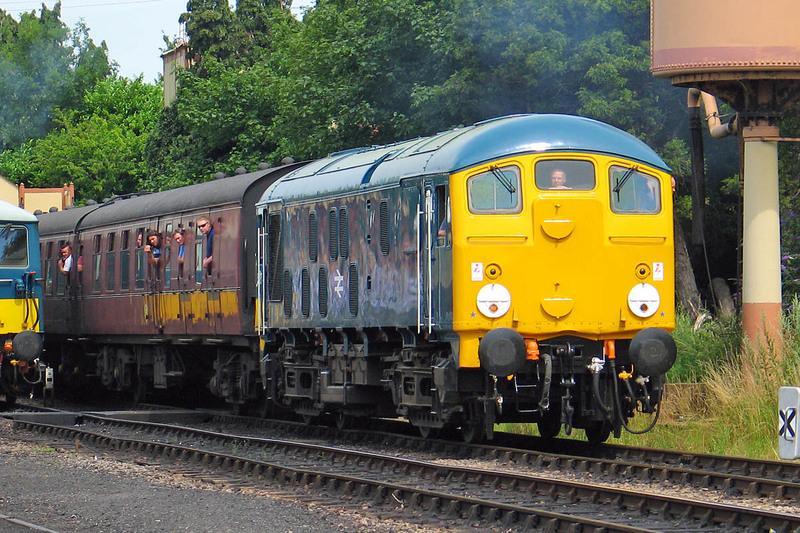 Restored by the Cotswold Mainline Diesel Group, here seen awaiting removal at Toddington. 45149 arrives at Toddington, from Winchcombe direction, in its novel and temporary colour scheme. Also newly restored by the Cotswold Mainline Diesel Group. 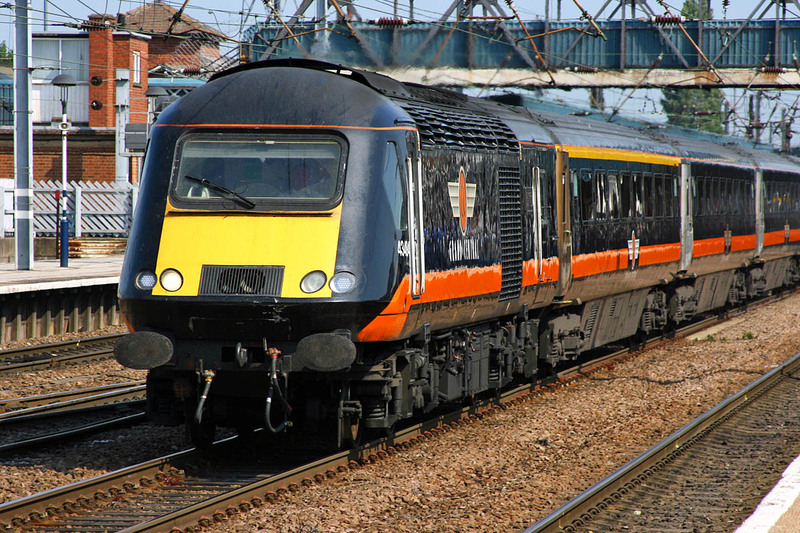 Many Class 70s are out of service. Those working in this area are 70008 (most active), 70016, 70017 and 70019. Eastleigh has 70001, 70018 (and 70099) for maintenance. 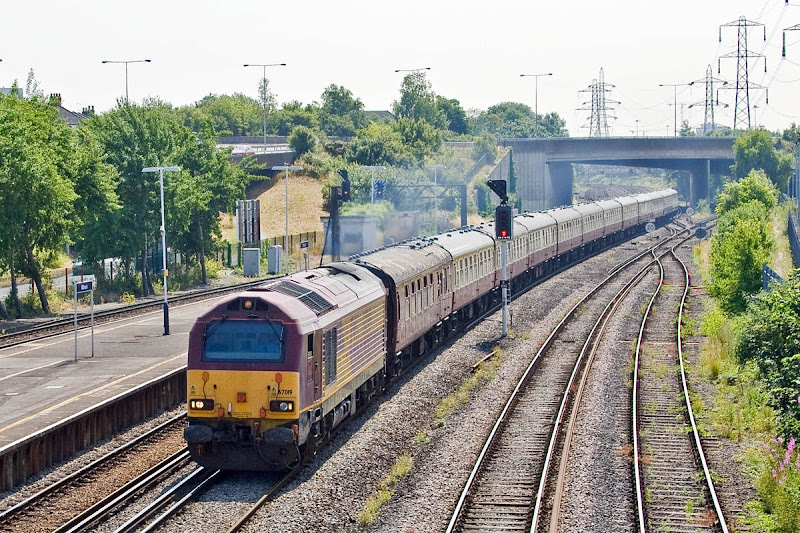 Led by 60116 Mountfield, 1001 is running as 1Z30 06:37 Hastings - Weymouth, passing Redbridge. 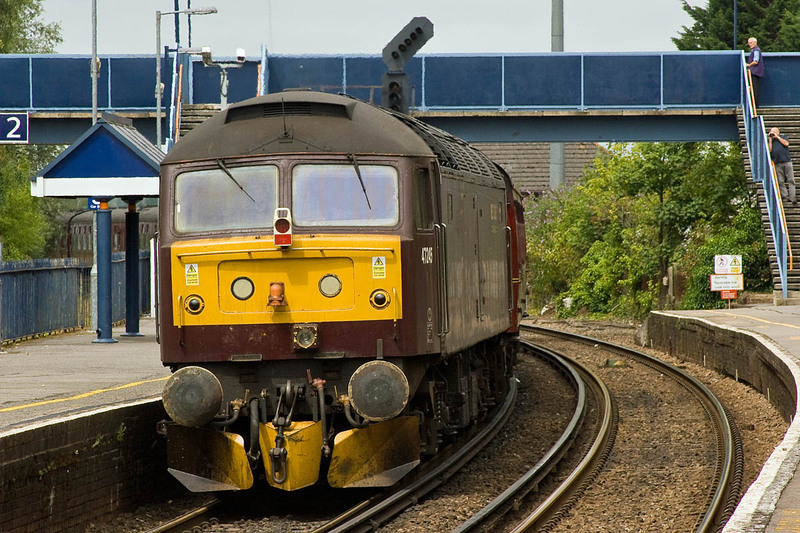 60118 Tunbridge Wells on the rear of the Hastings Diesels Ltd "Weymouth Envoy" tour. A few minutes earlier at Millbrook. Image by Ian Knight. Thursday 18th July: 70001 + 70017 + 70018 Maritime - Eastleigh, 70001 & 70018 now at Eastleigh LNWR for maintenance. 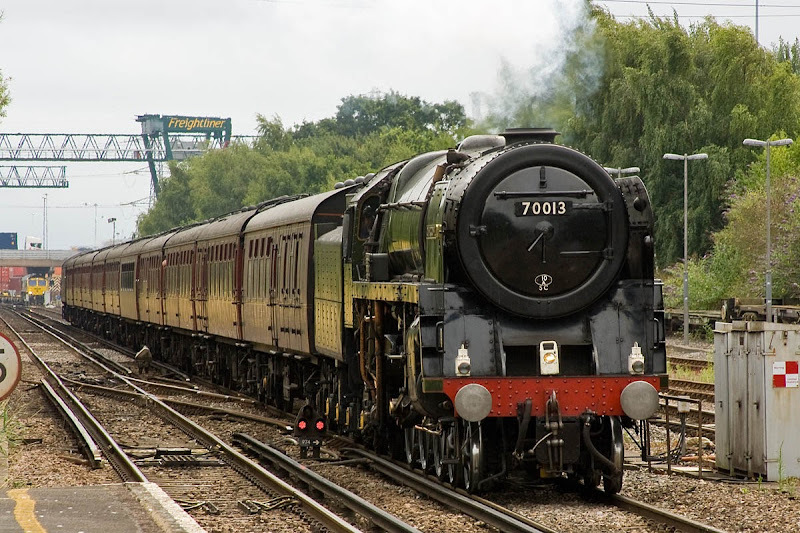 Meanwhile 70005 was moved to Midland Road, for assessment following its fire. 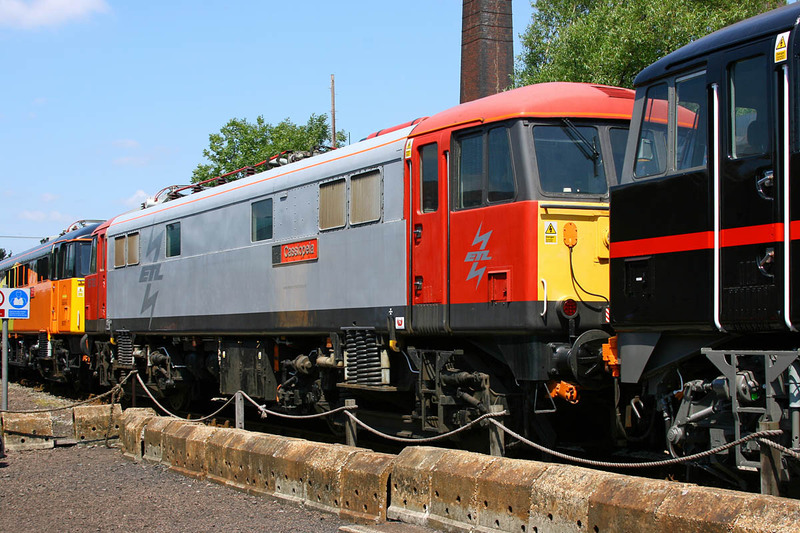 Europhoenix Class 86's at Barrow Hill on 6th July. 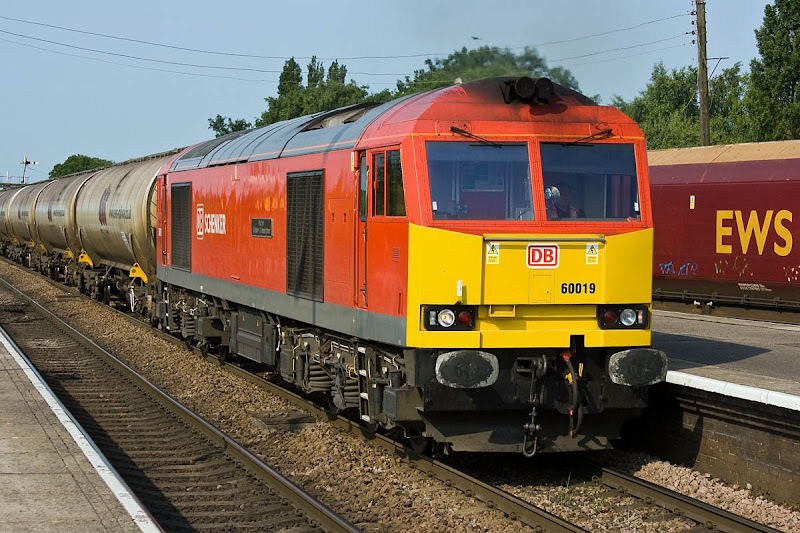 WNXX.com covered the removal of these locomotives for export through Immingham only a couple of hours later. 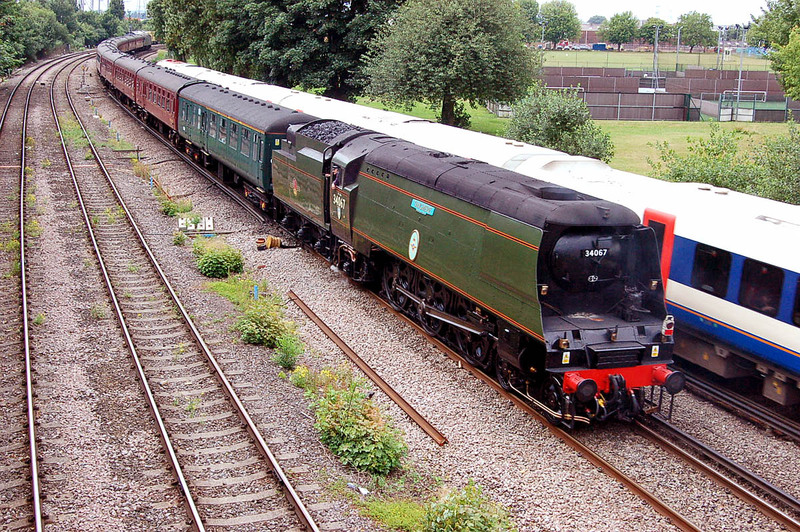 The locomotives arrived in a convoy behind 56312 on 4th July. 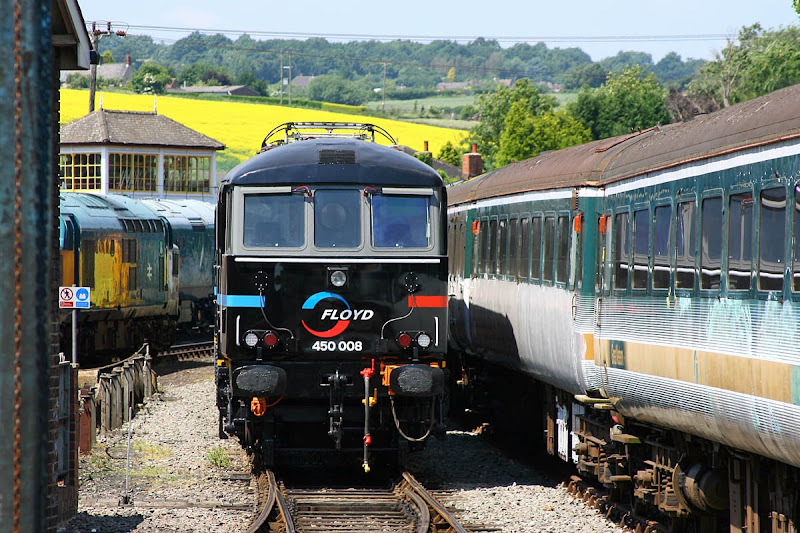 Floyd 450008 is the former 86242 James Kennedy GC and Colchester Castle, new as E3138 in January 1966, withdrawn October 2004. 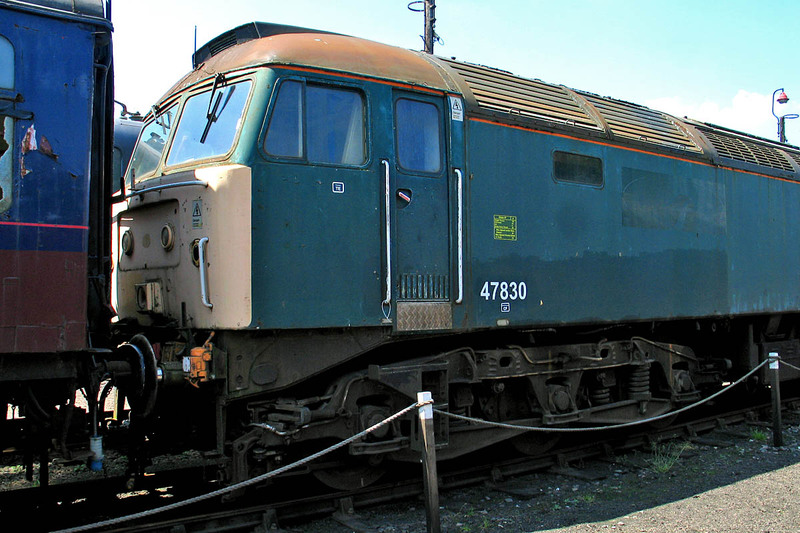 This was the locomotive involved in the Nuneaton derailment in June 1975. 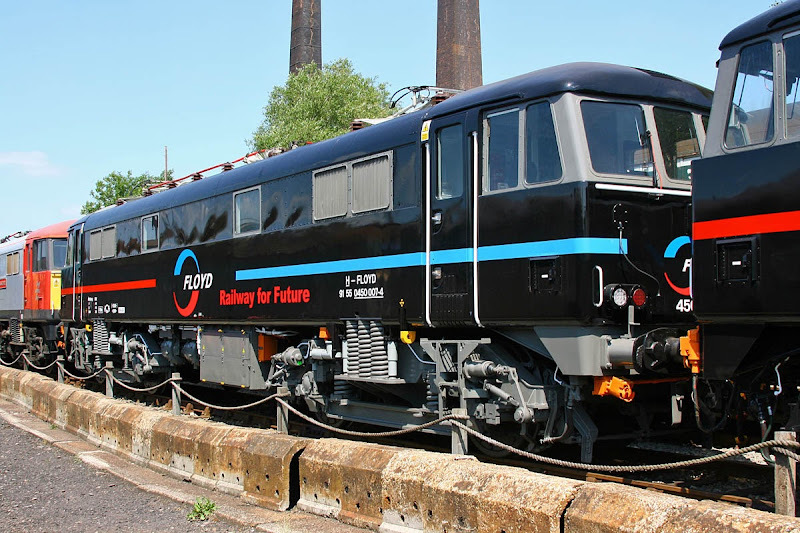 Floyd 450007 is the former 86228 Vulcan Heritage, new as E3167 from English Electric / Vulcan Foundry in August 1965. 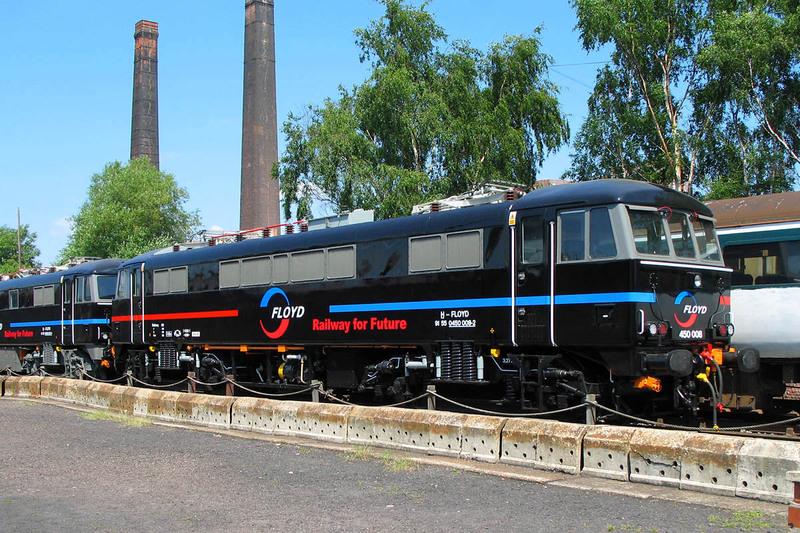 Revisions in the Floyd colours have been made to reflect full ownership by Eurogate. 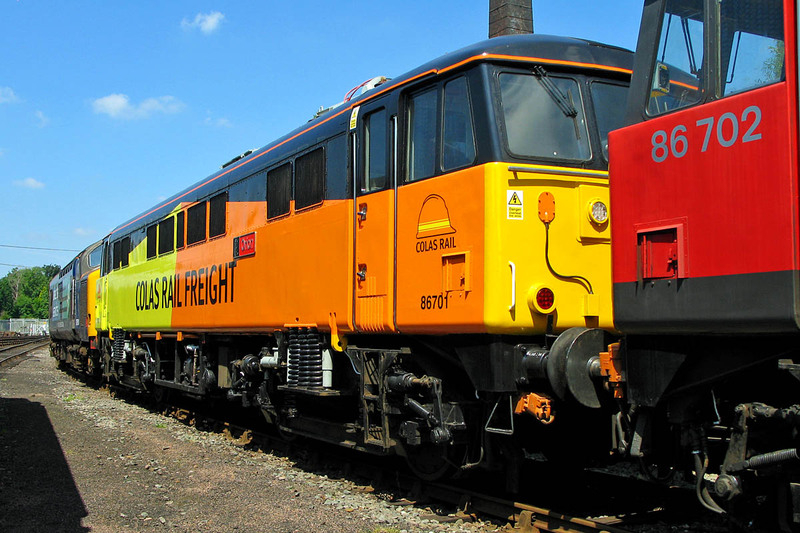 86701 Orion has been returned by Electric Traction Ltd to Europhoenix, and is in Colas colours following a very short engagement last year. 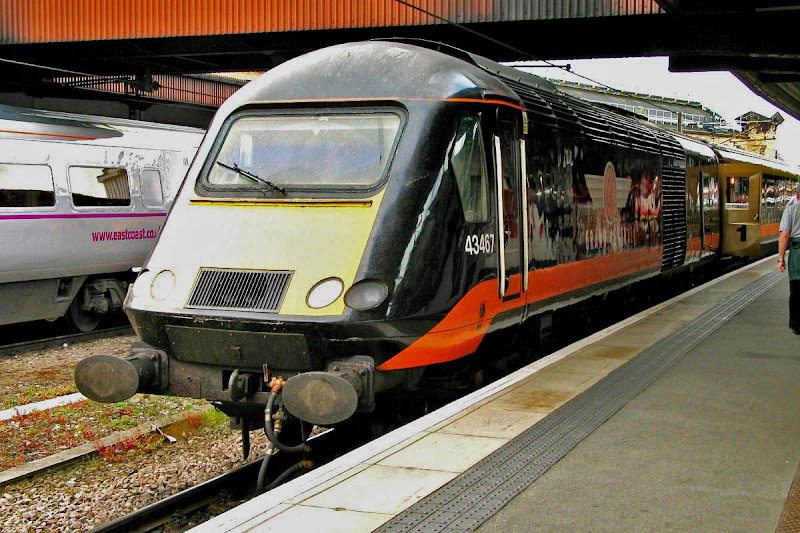 Formerly E3129 (Doncaster, November 1965), 86205 City of Lancaster, and briefly 86503 in 1988-89. Stored DRS 37510 is behind. 86702 Cassiopeia which was new as E3144 (English Electric / Vulcan Foundry, March 1966), then 86048 and upgraded to 86260 Driver Wallace Oakes GC. 86242 awaits arrival of low loader and a push up the ramp to be provided by 37510. 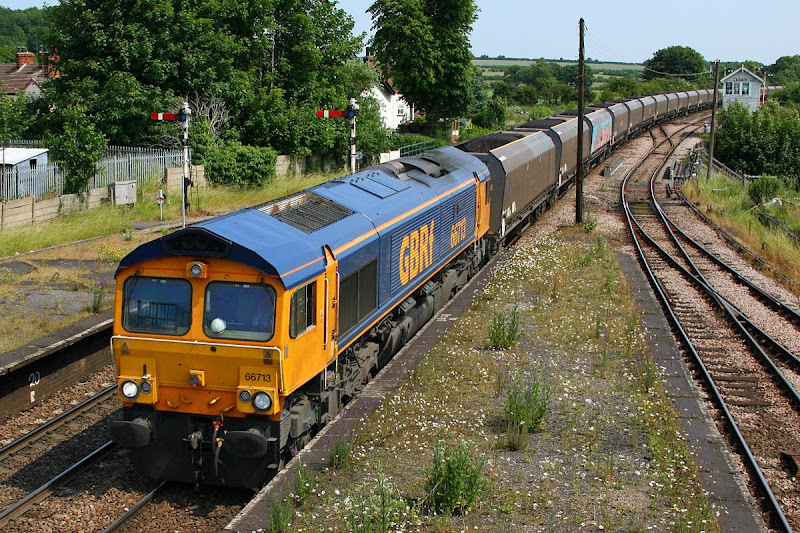 Locomotives in the background are 37275 and 50008 Thunderer. 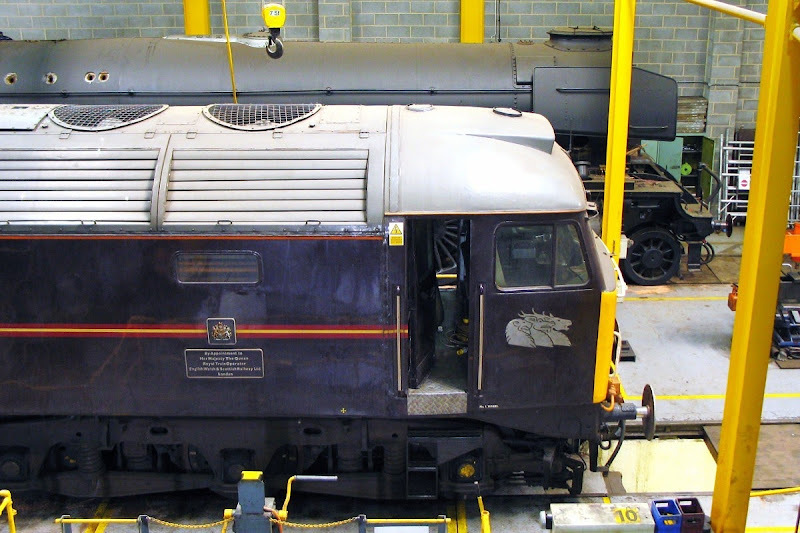 47798 Prince William in the NRM Workshop, with Flying Scotsman behind. 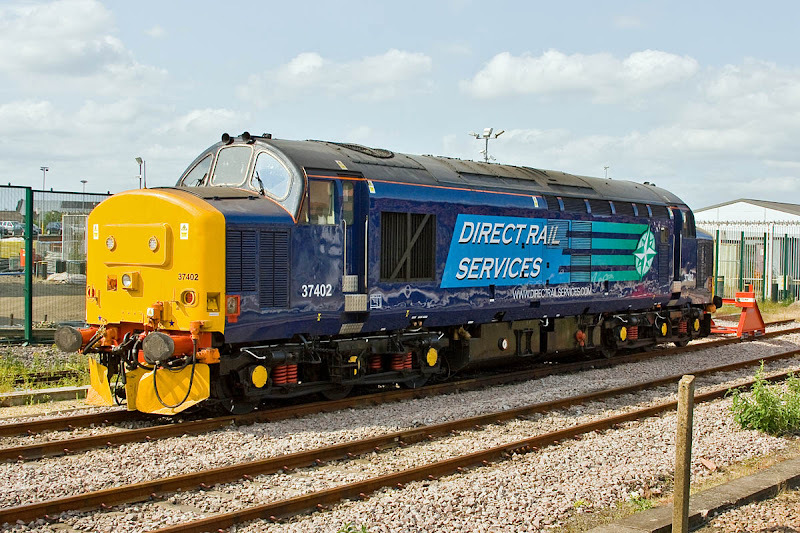 47830 is stored at Barrow Hill having provided parts in 2011 for 47811, which is shunting for Freightliner at Crewe. 6th July. At this link and also on Yahoo! groups. "70005 hauling 6A02 1130 Wigan Station Junction-Crewe Basford Hall was stopped at Hindley, Driver reporting smoke coming from cab. Fire Brigade called and extingushed the fire at around 1210. 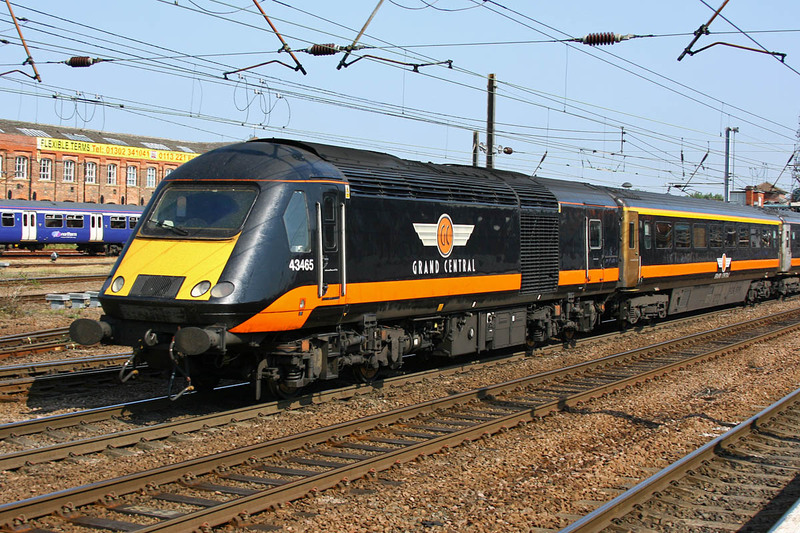 70005 and train eventually dragged back and dumped in Platform 1 at Wigan North Western lines re-opened to Manchester around 1400." 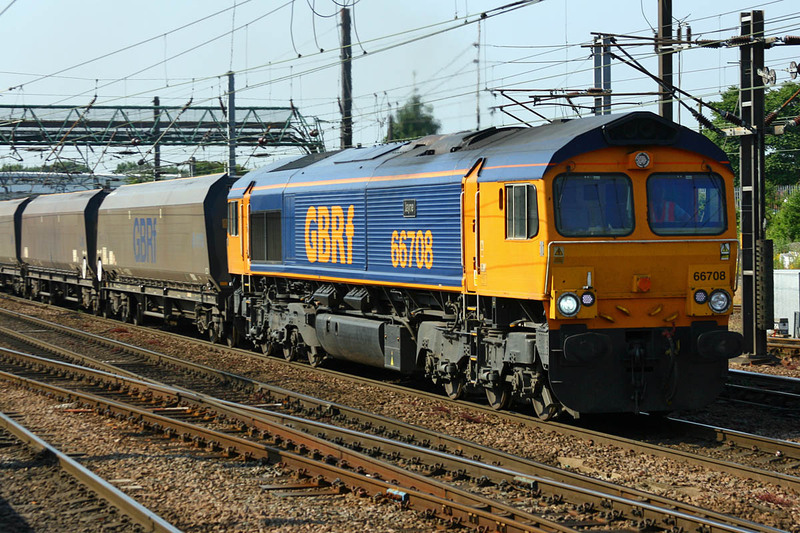 "Just seen it being dragged past me by 66506. One of its roof 'hatches' has been well toasted! It must have been fairly well alight, because the fire brigade were called by a member of the public." 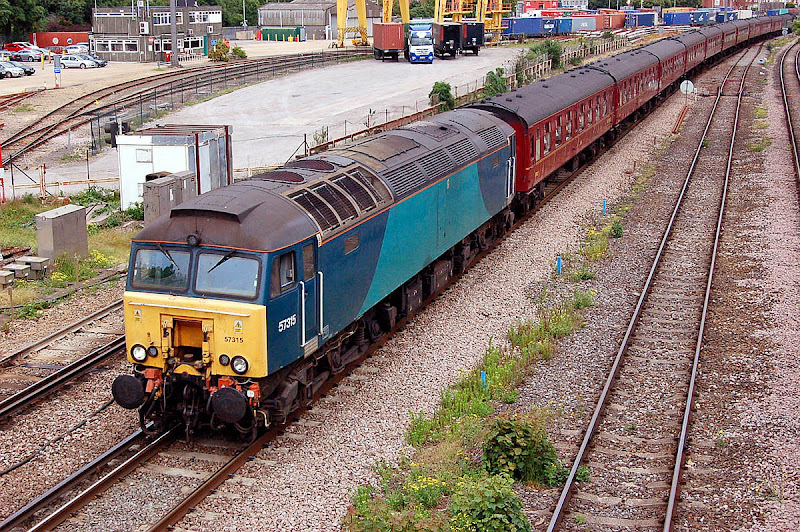 Further to the report of 16th February, 57312 is back in traffic following repairs at Eastleigh Works. 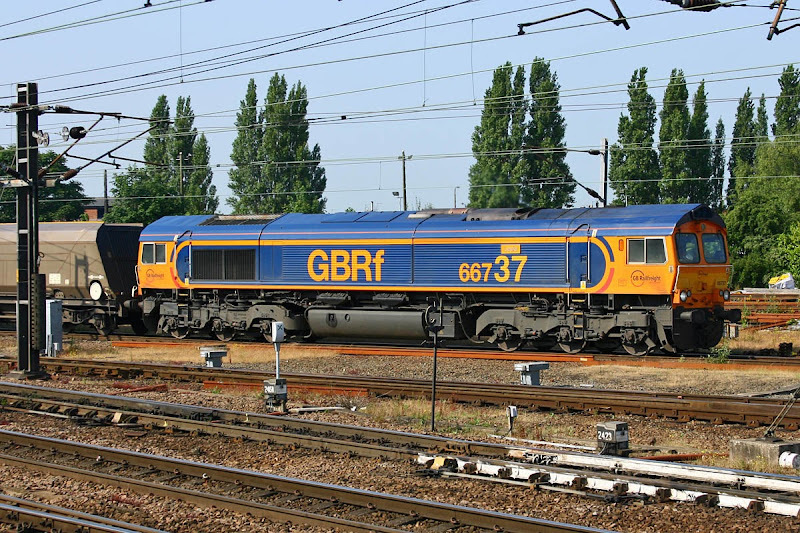 The first workings recorded was a 0Y68 with 57305 on 4th July, confirmed at wnxxforum. There is a picture of the locomotive departing on its test run. 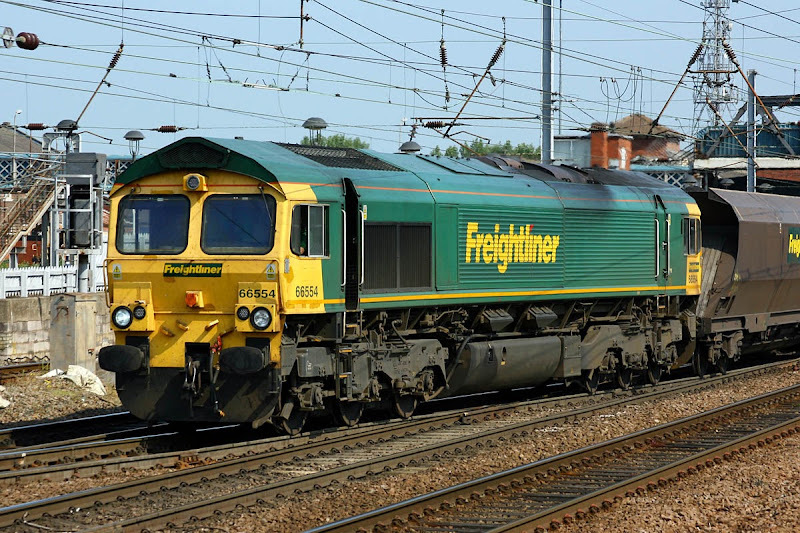 That may have been a close one, but this locomotive does appear to be needed by Network Rail, and lease conditions are believed to require that it is eventually returned in similar condition to that which it was delivered. 66109 with a DBS coal working working through platform 4, recorded as 07:17 Leeds Signal L928 to Scunthorpe Coal Plant, so must have worked through the repaired line at Hatfield. 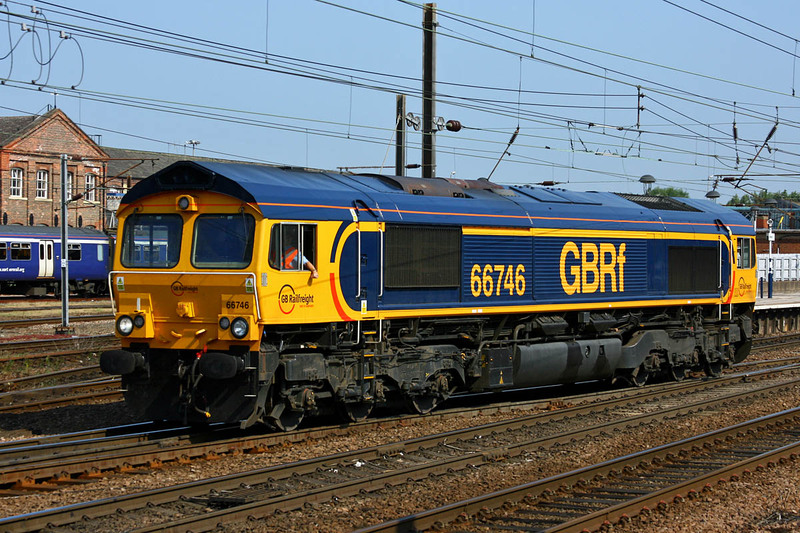 66746 (formerly 66410, 66845) works light southbound as 09:23 Selby - Peterborough GBRf Maintenance Shed. 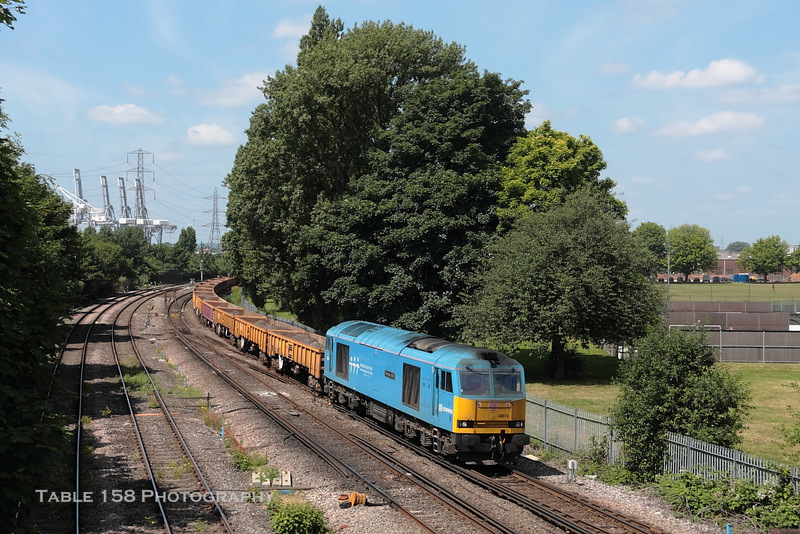 60039 passing Totton on the way to Marchwood, 10th July. Image by Ian Knight. 67019 passing Millbrook with the tour from Cambridge to Weymouth, 13th July. 70018 has been a bad engine again, and the Fat Controller has ordered him to sit in the yard at Maritime. 70018 appears to have received some attention (wheel turning?) at Cardiff Canton, but while now moved to Maritime, appears to remain sidelined. 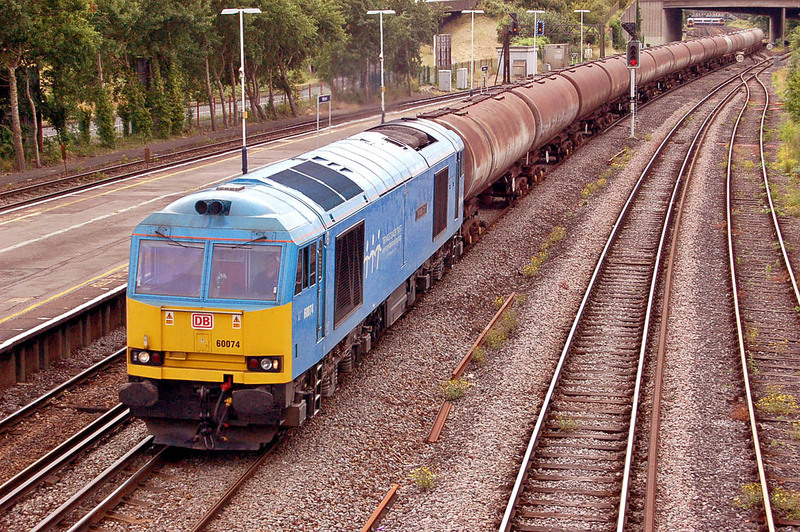 158885 is understood to have moved to Bournemouth to be fitted with a ZF Ecomat gearbox. 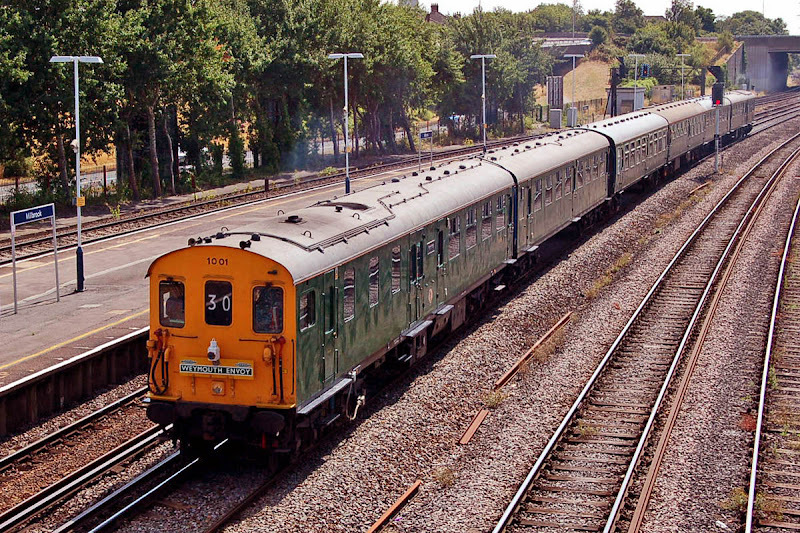 The update, at first on one car, is expected to take three months and will be tested on the Swanage Railway. 43467 (formerly 43067, new Crewe October 1977) on 1N90 07:49 Kings Cross - Sunderland, York, 4th July. 43468 (43068, Crewe November 1977) on 1N93 12:53 Kings Cross - Sunderland, at York, 4th July. 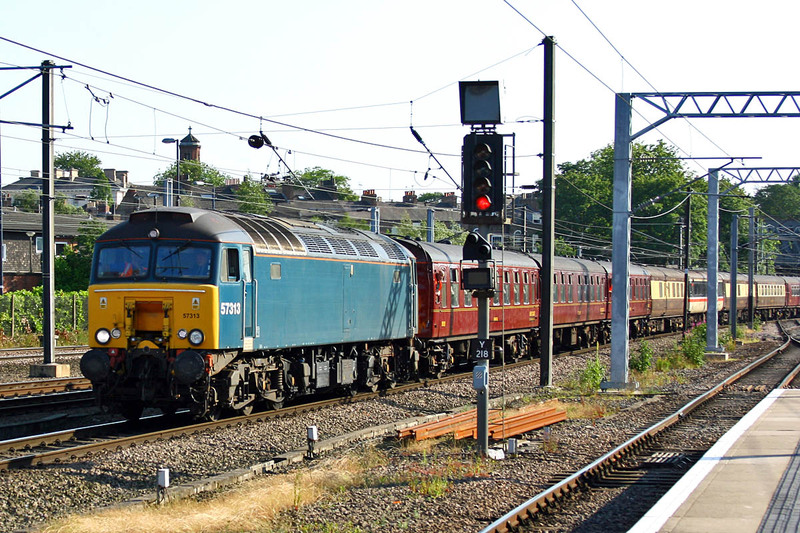 50912 JAMES HERRIOTT (180112) departing York with late running 1A66 14:06 Sunderland - Kings Cross. 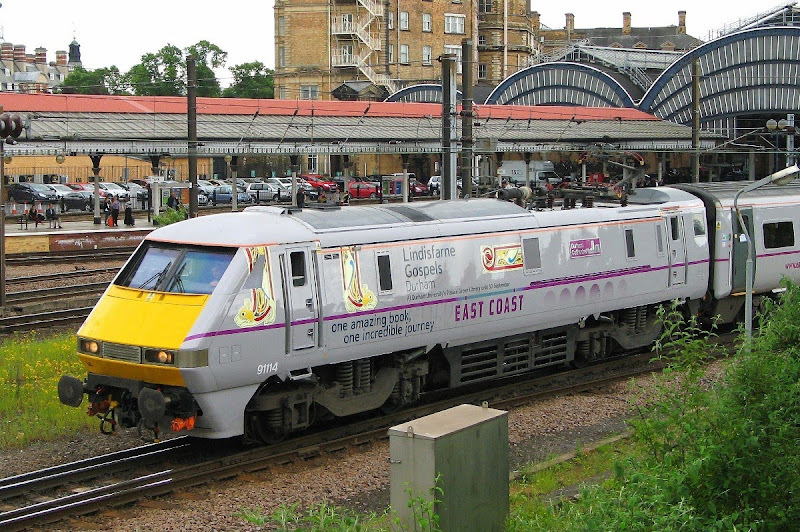 43467 again on 1N90 07:49 Kings Cross - Sunderland, Doncaster, 6th July. 43465 (formerly 43065, Crewe October 1977) on the rear of the same train. 43484 PETER FOX 1942-2011 PLATFORM 5 (formerly 43084, Crewe, February 1978) runs southwards at speed with 1A61 08:30 Sunderland - Kings Cross. 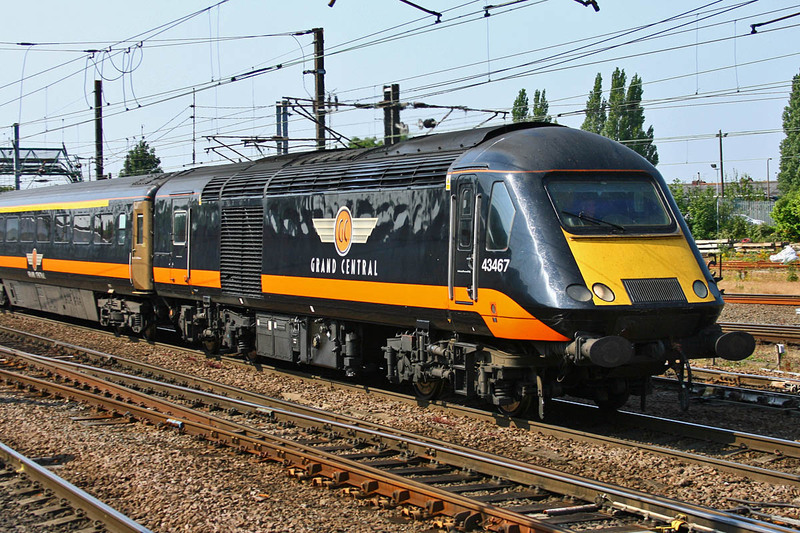 Doncaster, 6th July. 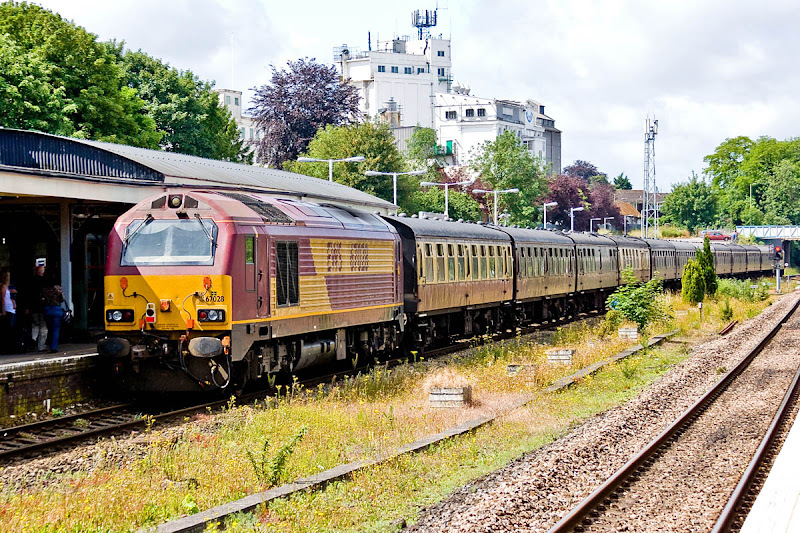 67020 deputises for failed 35028 Clan Line with the 'Cathedrals Express' to Exeter, passing Andover, 30th June. 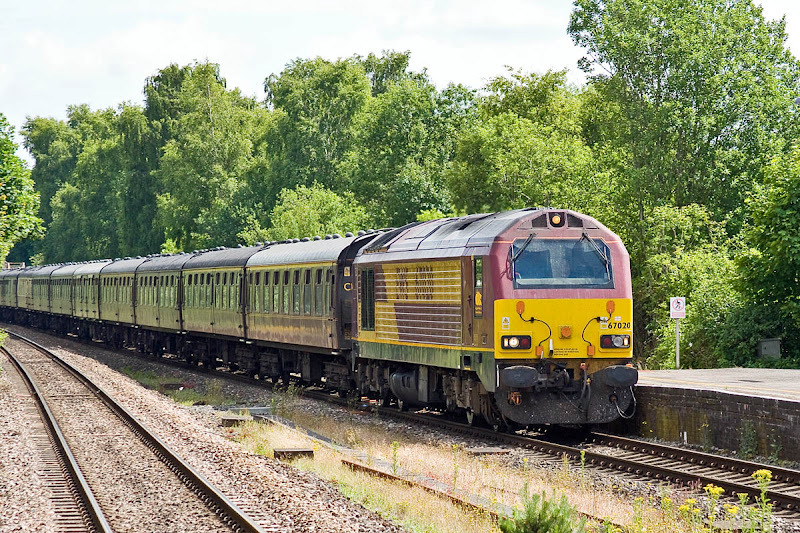 67028 on the rear of the SRPS Railtours set, which is currently hired to West Coast Railway Co.
66848 runs around on 6D86 Wolsingham - Scunthorpe BSC (CHP), this working rerouted around the Hatfield slip, for which normal routes were resumed on 8th July. 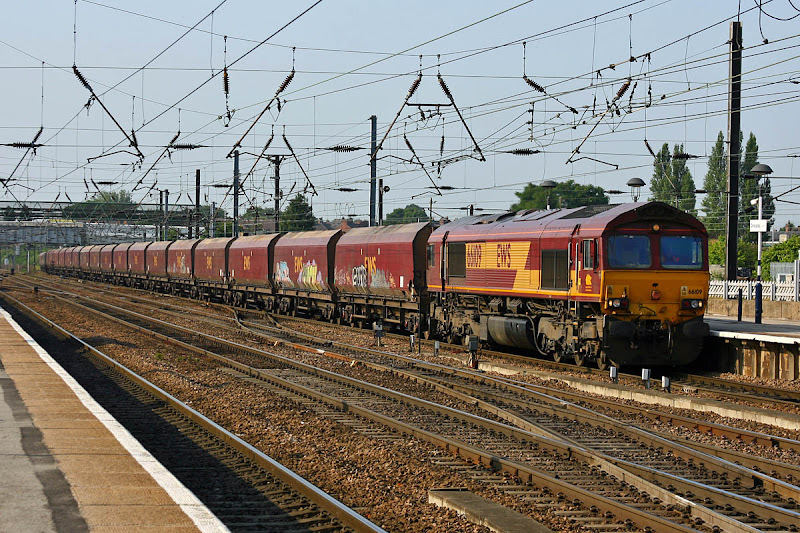 66097 heads through the station on 6E32 Dollands Moor - Scunthorpe steel bar empties. 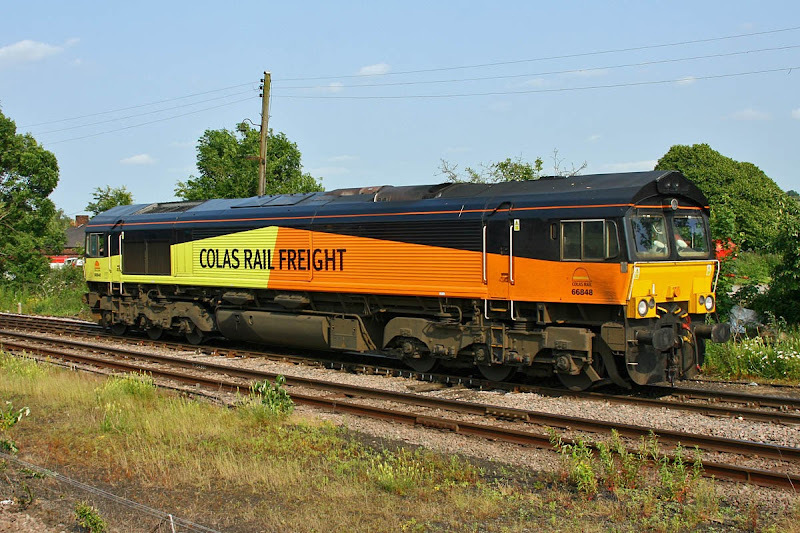 This ran around at Immingham for the period of the Hatfield diversions, and returns into the setting sun. 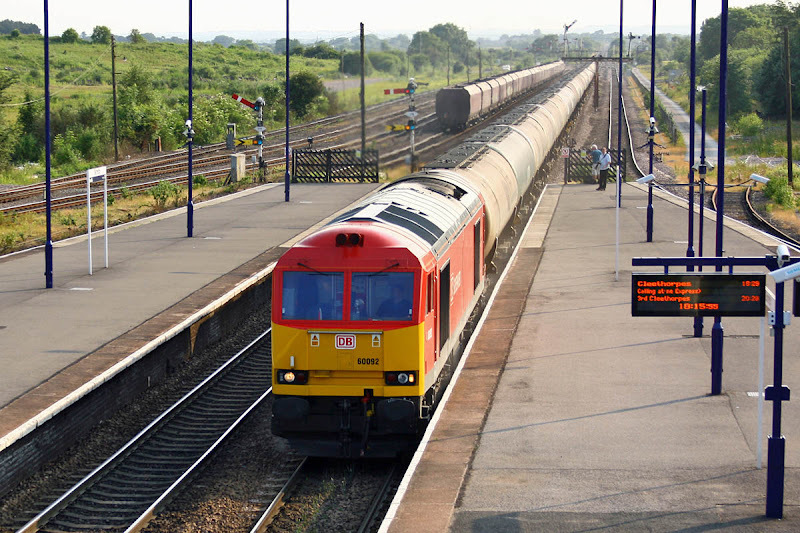 The North Lincolnshire Resignalling Project is under way, with a project office located at Barnetby. The signals at Barnetby and Wrawby Junc. are expected to be gone in 2015. The project is awarded to Alstom / Balfour Beatty. With thanks to Ian Knight. 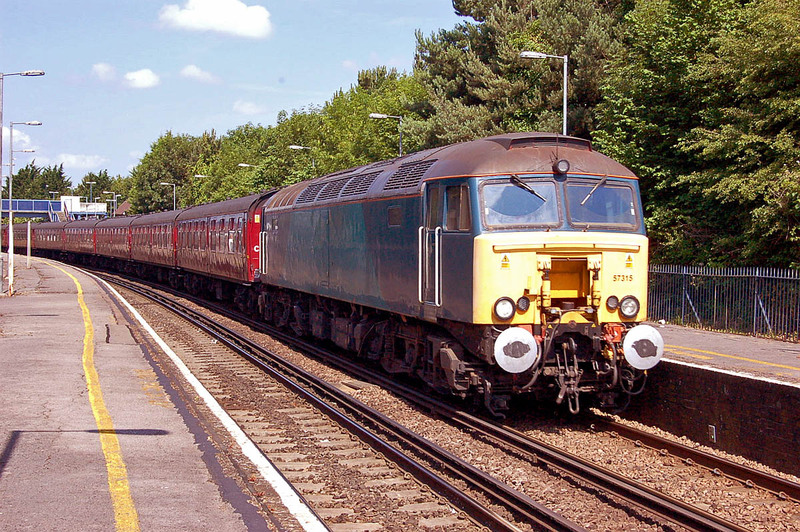 57315 passes Millbrook with 5Z80 09:45 Southall - Poole, 3rd July. 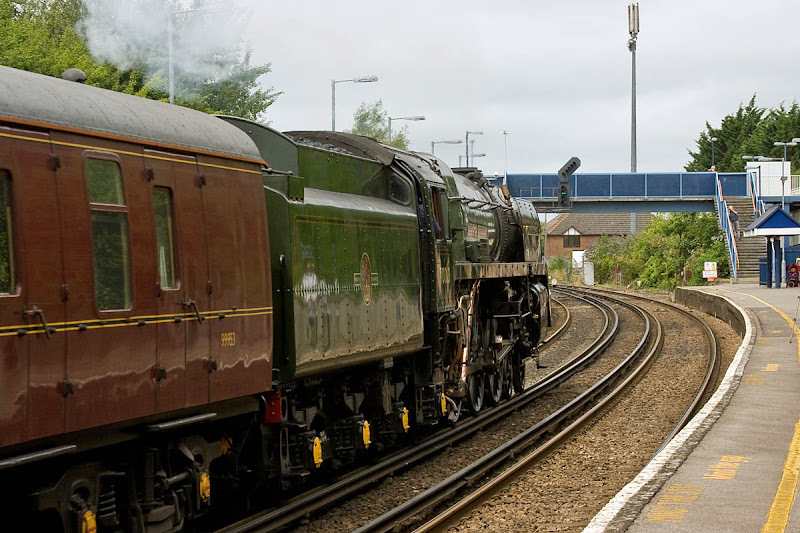 34067 Tangmere on the rear. 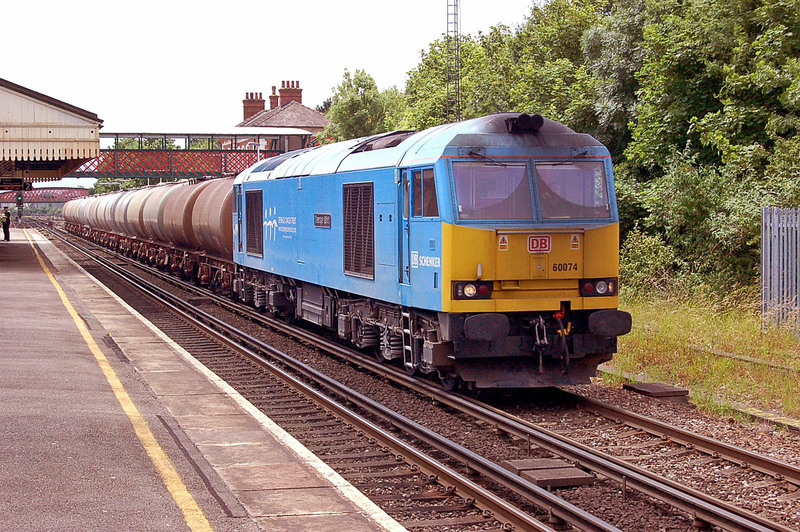 60074 Teenage Spirit at Millbrook, 6B93 09:38 Eastleigh - Fawley, 4th July. 60074 returns past St Denys with 6B94 12:00 Fawley - Eastleigh. 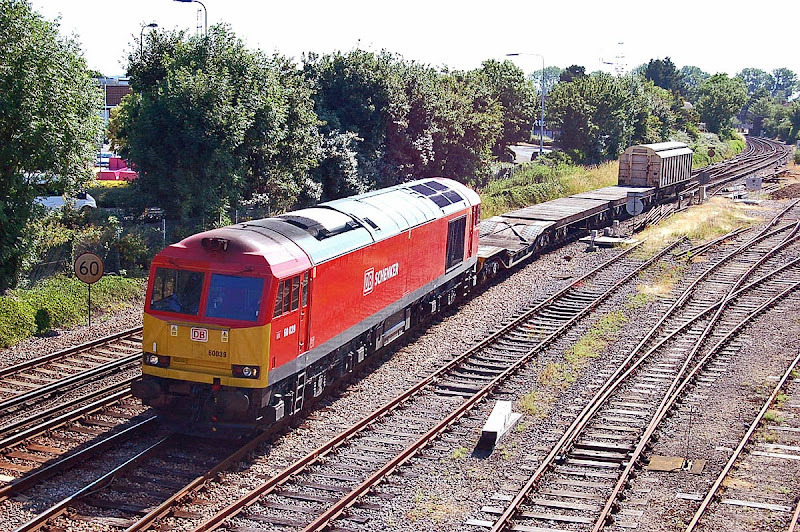 57315 passes Redbridge with 5Z82 10:10 Poole - Southall, Friday 5th July. The usual review of workings is delayed. 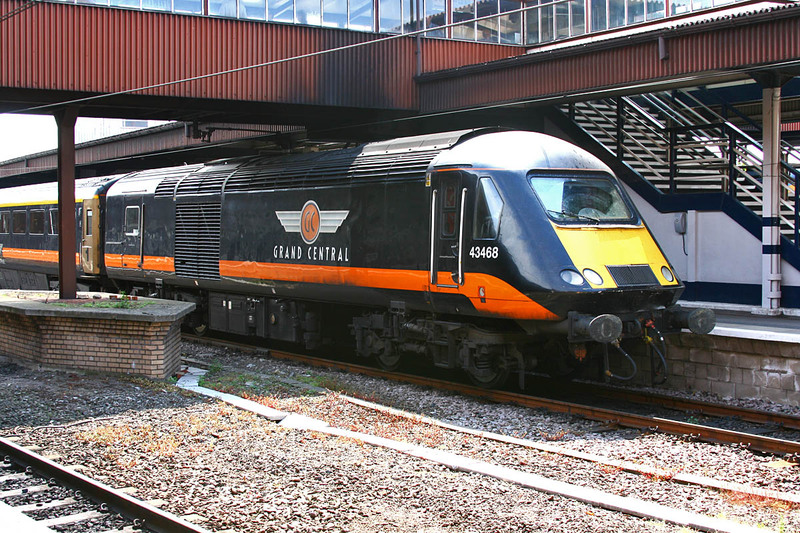 70018 is now understood to be at Cardiff Canton for maintenance. DRS 37402 lies failed in the siding at York. 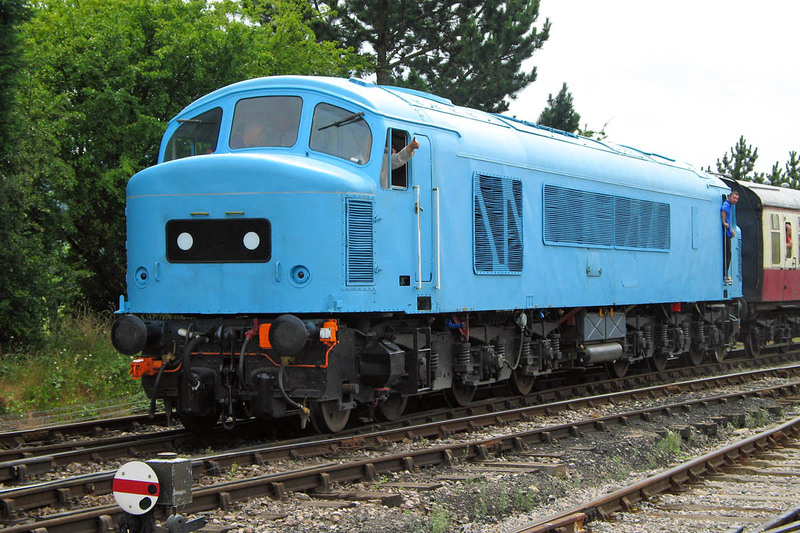 Restored to usage from Barrow Hill earlier this year. 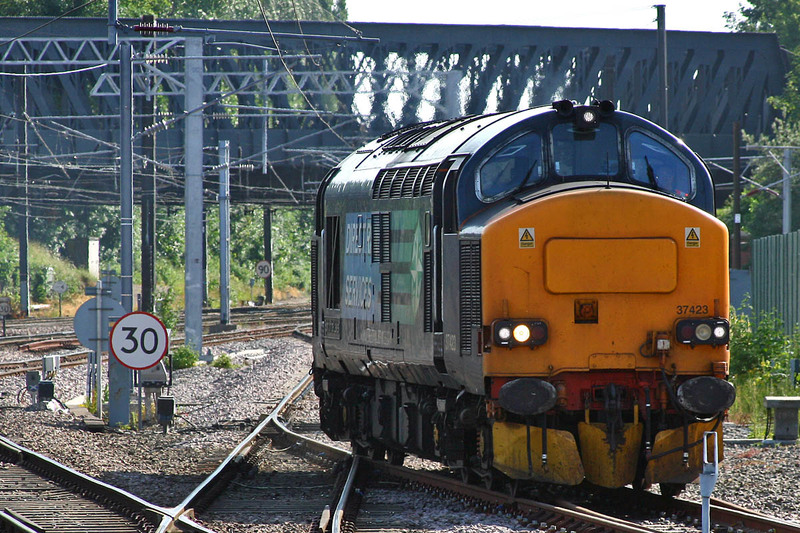 37423 Spirit of the Lakes joined from the south, it is understood to have been involved in testing of lines around the Hatfield Colliery slip, where normal services resume on 8th July. 91114 has been named Durham Cathedral and advertises the Lindisfarne Gospels exhibition. 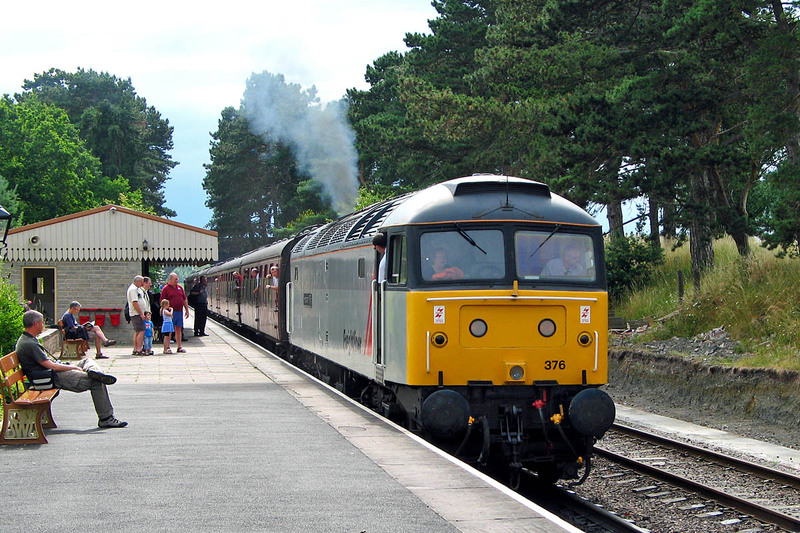 WCRC ECS from Carnforth to Saltburn, for 'The Saltburn Riviera' the next day to Torquay, led by 57313.